Pete Carroll says this defensive front is the fastest he has had in Seattle — clearly a nod to the addition of Clark. The coach was stoked about the unit after the scrimmage last weekend, and he is clearly excited about a pass rush that features Bennett, Avril, Clark, Hill and Bruce Irvin. The one bummer was the release of Tony McDaniel, who turned out to be the cap casualty over Mebane after the big contracts given to Russell Wilson and Bobby Wagner. Bennett still is unhappy with his contract, and he even told McDaniel he would love to be back in Tampa Bay (he probably saw the Bucs’ salary cap space: $13.7 million). But Bennett has been mentoring Clark, who is going to be Bennett Jr. this season — an inside-out player. Rubin basically is McDaniel’s replacement, but he should be up for it. Carroll also has sung the praises of Mebane, who is coming off a hamstring injury that ended his 2014 season early. Bennett, Avril, Clark, Mebane, Rubin and Hill seem to be the locks — leaving perhaps three open spots. Marsh is working purely as a LEO in this camp. The coaches seem to love him, which would leave probably two spots. Scruggs, Dobbs and Smith would seem to be the top candidates, but the fan favorite surely has to be Williams, who had surgery for kidney cancer three months ago and is going to play in the first preseason game. What to watch: Clark mimicking Bennett’s role and Williams finally getting to play. Pierre-Louis and Irvin have been the notable players on this unit — KPL because of his speed and Irvin because he has bulked up. Carroll has praised both players as among the standouts of camp. Pinkins is another conversion project, moving from the secondary to the second level of the defense, and Carroll has said he probably has come the farthest of any player in camp. Of course, that might not say too much considering how far he had to go. There seems to be very little mystery about this unit. It should be basically the same as 2014 (minus Malcolm Smith). What to watch: How has Pinkins adjusted? As we wrote Thursday, it’s the Legion of Baby Boomers right now — with none of the mainstays available for the first game or perhaps the second. But Carroll is very excited to see the new corners perform. 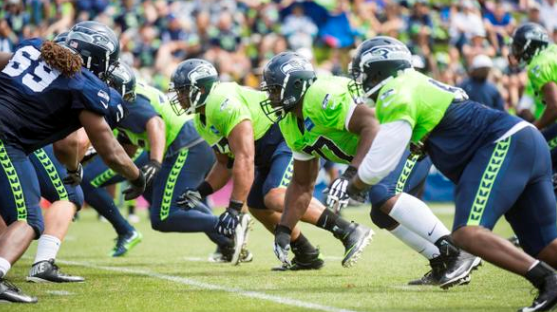 It will be a great chance for Burley, Seisay and the rookies to show what they can do. If they show well, it could make the Hawks think twice about removing Simon from PUP — if he stays on, the team could stash him for the first six weeks of the season and see where the corner situation sits at that time. The competition at safety has been pretty hot, too, with Bailey pushing Shead and the three rookies taking turns making big plays in practice. What to watch: What not to watch? It’s the most intriguing position of camp, and every snap counts for these Baby Boomers.